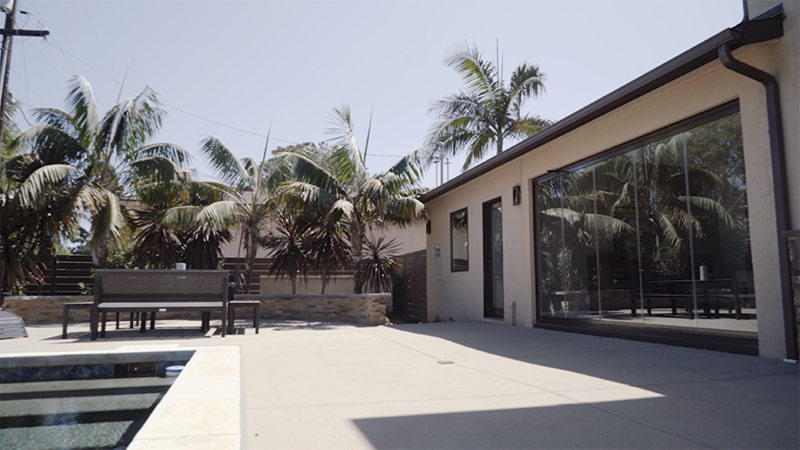 This humble abode in Point Loma is a great example of just how effectively the Cover Glass system can transform a homeThe homeowners chose to install systems in multiple areas of their house to take full advantage of the flexibility and aesthetics sliding glass brings. Let’s take a tour to see what they did. 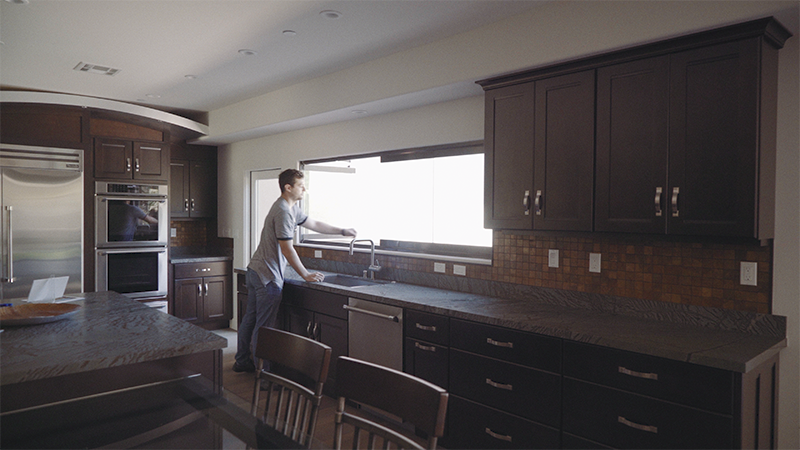 Besides a window system above the countertops enhances functionality and comfort in the kitchen. Now, there is plenty of natural light entering the room right where it is most useful. When the window is open — and it can open fully, thanks to the stacking panels — fresh air fills the room, removing cooking odors and helping the room remain at an ideal temperature. When we examine the kitchen window close up, we can see how it looks out onto an attractive view of the garden. Even when the panels are completely closed, the picture is crystal clear, adding to the pleasure of being in the kitchen, as it brightens up even the most routine tasks, like washing the dishes. In this photo, we see a view of the kitchen window from the outside, which demonstrates just how convenient the setup is. The shelf right by the window allows the homeowners to use the opening as a bar or to pass dishes of food to friends and family members outside. Either way, it’s excellent for entertaining. You can also see how the glass panels fold out of the way to on side, maximizing the size of the opening. Without Cover Glass, the living room would feel much smaller. 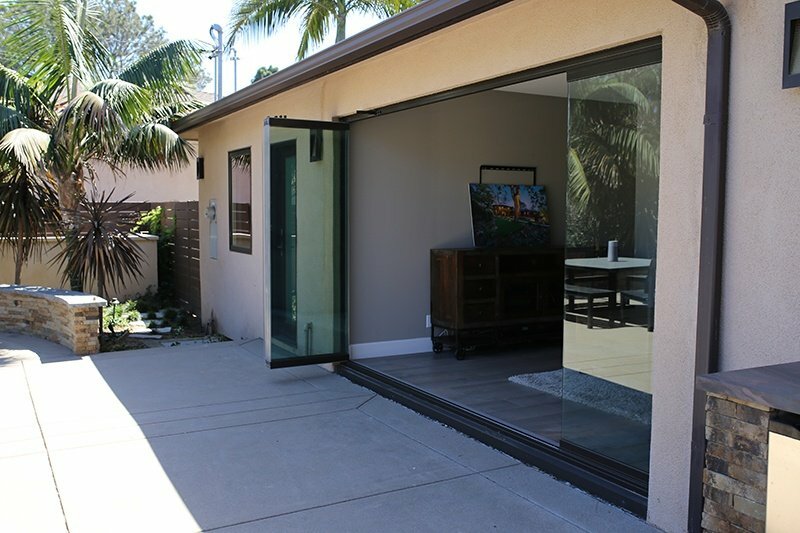 Even with traditional bottom-rolling glass doors, it would be impossible to gain such a large opening. The recessed lower tracks add to the seamless connection between the interior and exterior, as the homeowners can walk straight outside without stepping over anything. The view from the outside is equally impressive. 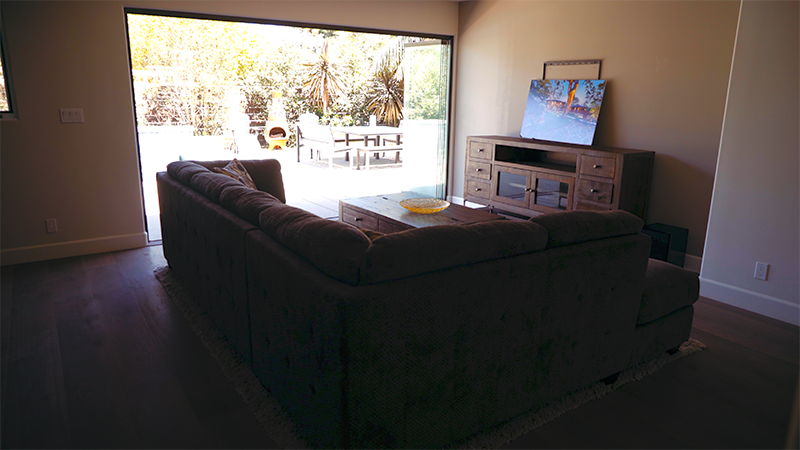 Here, you can see how elegant the frameless sliding doors appear and how well they match the style of the house. Furthermore, the reflective glass maintains privacy for the inside. Best of all, though, is that when the door closes, the home is completely secure because of the extra-strength glass and the top-hung panels, which cannot push open from their tracks, as well as the advanced locking system, which only allows the panels to be unlocked from the inside. 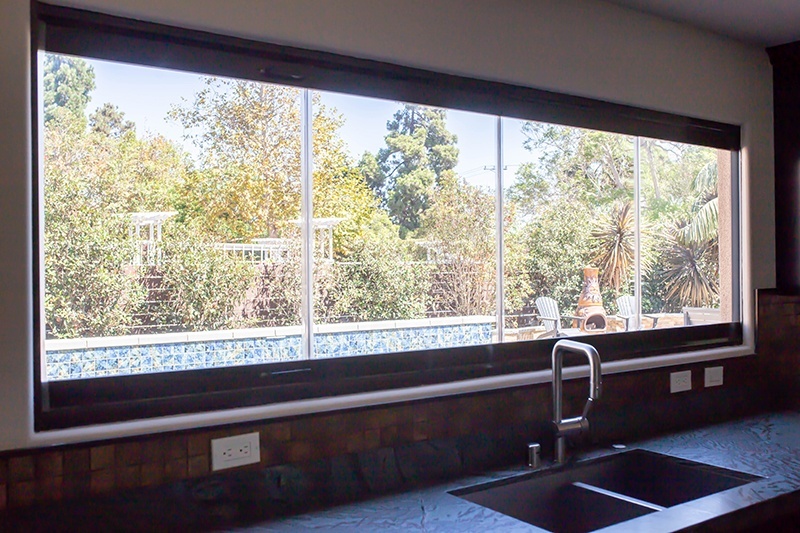 There are a variety of ways to open the sliding glass system: you can open all the panels, open just one for a doorway, create air gaps, or open some and leave others closed. This photo shows the last option and demonstrates how one or more panels left in place can form a glass wall. In the picture, you can also see that the homeowners’ choice of a black track complements the interior design. When you have limited space, it is extra important to take full advantage of what is available to you. This closeup of stacked panels shows how little space is needed to open the door. 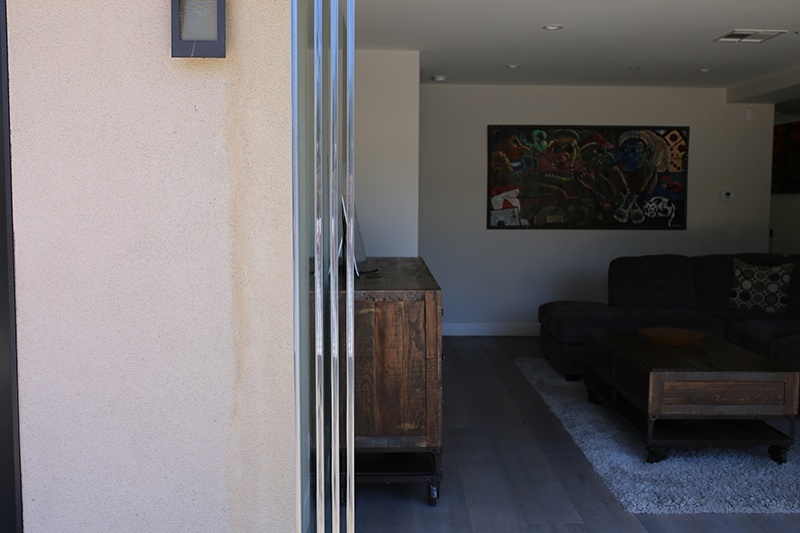 The addition of Cover Glass transformed this humble home into a picture of modern elegance. 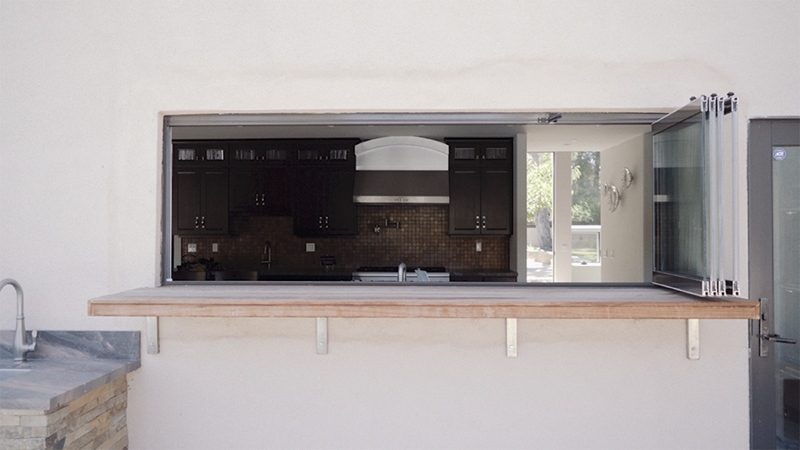 In other words, expansive, upscale projects are not the only ones that can benefit from our sliding glass systems. If you want to improve functionality, infuse flexibility into your space, or take advantage of a patio, a balcony, or even great views, Cover Glass is the solution. Want to Customize Details about your Cover Glass project?